November | 2012 | what? bread? Pat has been baking for a long time, over 30 years, and has supplied tea-shops and more fund-raising cake stalls than most of us can imagine. She’s put this book together as she wanted to get her recipes out into the world and also do some fund-raising for Iain Rennie Grove House Hospice Care. THIS BOOK HAS BEEN WRITTEN SOLELY IN AID OF IAIN RENNIE GROVE HOUSE HOSPICE IN ST ALBANS HERTS WHERE I HAVE BEEN A VOLUNTEER FOR ABOUT 8 YEARS NOW. Finally – my recipe book of all my cakes baked over the past 38 years (!) and a few new ones too – has arrived. It has taken me the past 10 months to produce this book and I am sure you will be as pleased with it as I am – if you buy a copy or more! 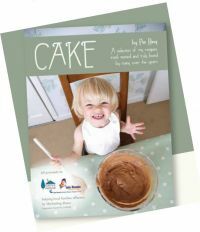 The recipes are clearly and simply written so that anyone will be able to turn out some gorgeous cakes for any occasion – family, friends, charity sales, whatever. They range from the quick and easy ones to those that require a little more time. I have ensured that a minimum number of different tins are used and there are sections on freezing, microwaving and adapting the recipes for special diets too. The idea came to me last winter after we had had an especially successful Charity event (as well as working at the Hospice, I co-ordinate all baking for our events) and people were suggesting I type up my recipes and sell them for 50p a copy. Over Christmas, I decided I could go one better, and at my time of life I could let all my recipes go, but in a good cause. which Grove House certainly is. We provide 24 hour Hospice at Home care, Day Hospice care and a range of support sevices for local patients (and their families too) suffering from life limiting illnesses. OK – can I do the blog about Christmas puds in less than half an hour while I wait for the LakesBakes bread bakes? Christmas puds are an ‘essential’ part of a British Christmas, but some people don’t like them, actually quite a lot of people don’t like our traditional Christmas foods but that’s their loss. I do like Christmas pud and would eat more of them if they weren’t so calorie and fat endowed. You can read the history of Christmas puds on many websites and the wikipedia one has most of what you really need to know. Recipes also abound and include all sorts of sugars, alcohols, dried fruit etc etc. all the baking names have their own take – Delia, Nigella, Nigel Slater and the BBC Goodfood website has recipes you can browse and find one you like the look of. But the humble or not so humble Christmas pud means different things to everyone, and something that most people eat only once per year can be invested with associations and memories. When I was younger my great auntie used to make us two, one for Christmas and one for Easter. I don’t know what she put in them but they were always very dark in colour and they set a sort of pudding benchmark in my mind. My mum died when I was in my early 20s, so I have been a ‘provider’ of Christmas ever since and choosing or making the pudding forms a central part of my festive activities. On balance I prefer not to have to buy a pudding for our Christmas dinner, mostly because I think they are very expensive for what they are, but sometimes you can get a surprisingly good one from an unusual source. As a post-grad student at Lincoln College, Oxford, the kitchens there used to make puds for sale to the students and staff, and very good they were too. I read recently that the chef, Jim Murden, and butler, Kevin Eglestone, both retired recently, and their successors have a lot to live up to. As a mark of the respect the college held them in they had a portrait painted. How cool! When I worked at Bournemouth University (or Wally Poly as it was then) the trainee chefs on the catering courses produced puds for sale as well, and they weren’t bad either. Unfortunately the catering courses seem to have gone the way of good things and the courses are all to do with hospitality management these days, not making food for people! So those puds are consigned to memory lane as well. Caterers, however, sometimes let the side down. I really should know better than to order Christmas pud when work takes us out for festive meals. The drive for profit in the organisations that provide these meals means they tend to select the cheapest, least fruity and toughest puds they can. Little Horwood House – I hope they read this – probably supplied the worst Christmas meal I’ve ever had a couple of years ago and included little carrots that were under-cooked and squirted off onto the floor more often than they made it into anyone’s mouth, and a dreary slab of treacle flavoured goo that was closer in texture and spirit to parkin than it was to Christmas pud. They deserve the *** rating they get on Tripadvisor and probably don’t care what I think about their pud. It is also possible to get good puds from supermarkets, and the ones I’ve liked best in recent years have come from cheaper supermarkets that sell bargain puds. The reviews of this year’s Aldi offering that beat the Fortnum & Mason version fall into this category and if I hadn’t already made my pud for this year I would try and get one of theirs. Although Waitrose should be ashamed of tarting up their offering with glitter, that’s for kids and cards not food. Just checked the bread, a few more minutes…. Just how British they are struck home a couple of years ago when I was working on a project that involved, amongst others, a chap from Lancashire and a company based near Montpelier in France. As a gift to the French colleague, the chap from Lancashire sent some Christmas puds to France, and I believe they were well received down there, and consumed with gusto by their recipient, although I understand his children didn’t think much of them. This year I’ve made my pud using a recipe from the Great British Bake-Off Showstoppers book – no treacle involved as I don’t particularly like that. And I’ve had to have two goes at it because the first one drowned itself as it was steaming. Lesson learned – do not try to use a plastic bowl with a clip on lid because it will float and capsize in my largest saucepan, even with a 1lb weight on the top. So I did it again in a ceramic bowl with traditional greaseproof and foil on the top and all was good. 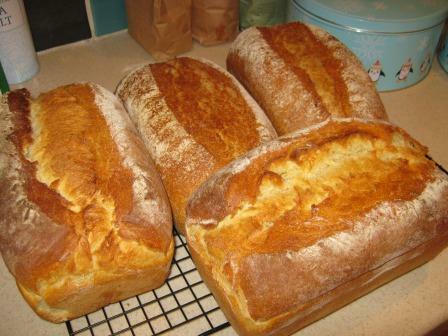 And here’s the bread – two loaves of 50:50 and two of sour cream bread. A Mellow Bakers suggested bake – Chelsea buns from Dan Lepard’s Handmade Loaf – these are Chelsea buns Jim, but not necessarily as we know them. 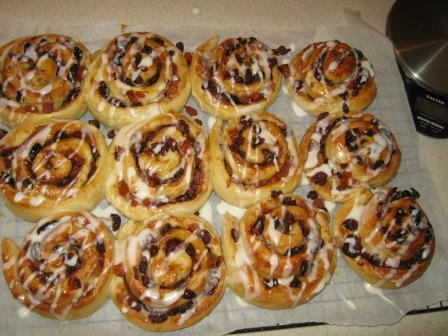 I’d like to offer some buns on LakesBakes but I’ve not found the perfect recipe yet, and this probably isn’t it…. yet. Filling is sugar, butter lemon and nutmeg, not the expected cinnamon, but only a tiny bit, so the flavour didn’t really come across strongly. I think I prefer more spice in mine. The dough rose nicely, it has golden syrup in and two eggs, so is quite rich. My kitchen is quite cold really but they were cuddled up on the hob with the saucepan that was boiling my Christmas pud, so kept the suggested 21 to 25 deg there while they needed it. 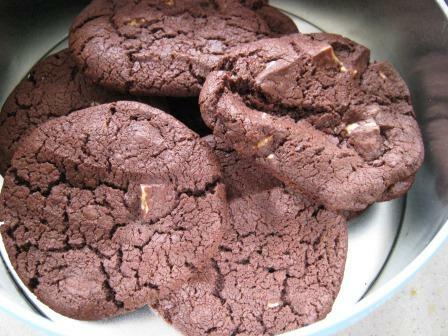 They also baked quite hard and the outsides are a bit crunchy, maybe they’ll mellow a bit if they get the time. I didn’t finish them with the sugar glaze as suggested, because some of the filling had leaked and caramelised on the bottom of the pan and things were sticky enough already. Tip to fellow Mellows – do use paper or it will weld itself to the pan. I had to use my roasting tin as I don’t have a 12 inch cake pan. I will be attempting Paul Hollywood’s version from the latest Great British Bake Off book at some point – and writing that blog about Christmas puds. I’m one of those people that don’t think that Halloween is a cute excuse for a dress-up and for kids to consume excessive amounts of sweets and go round the streets knocking on doors of people that they don’t know. It could be an excuse for teenagers or tweens or even grown-ups to have a party and get a bit scared playing silly games and watching age appropriate videos of a scary kind. It rained buckets here last night so dampened the enthusiasm of most of those who would have been trailing the streets with their parents looking for sweets last night. Anyway, our local church does a convenient line in ‘not Halloween party’ for tweens and younger and my offspring gets sent there for an hour or so to eat sweets and play games every Halloween. 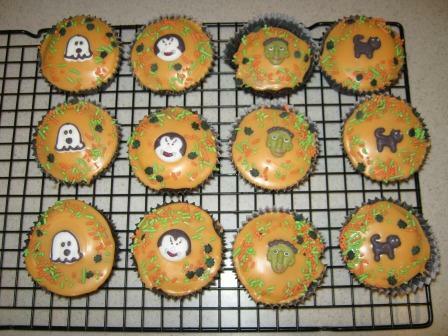 To make up for what he sees as a lack of Halloween spirit, I bake a few cakes, this year’s were chocolate sponge with orange flavoured water icing, some sprinkles and Halloween decorations.